Yes, the US middle class is shrinking, but it’s because Americans are moving up. And no, Americans are not struggling to afford a home. However, there are at least two serious issues and questions that need to be addressed: a) if the middle class did shrink, where did they go? and b) is housing really becoming less affordable for Americans? 1. Middle-Class Shrinkage. If the middle class is shrinking, where are they going? There are only two places/directions they can go: Up or Down. And in fact, the middle class really is shrinking, but it’s because so many US households are moving up to higher income groups, not down to lower-income groups, as the chart below shows (thanks to AEI’s Olivier Ballou). Over a slightly longer time period (1967 to 2016) and using a slightly different income measure of middle-class income ($35,000 to $100,000 in 2016 dollars from Census Bureau data) it’s true that the share of US middle-class households has been declining, from 53.2% of US households in 1967 to 42.1% in 2016, see left side of the graphic above. But where did the shrinking middle-class US households go? 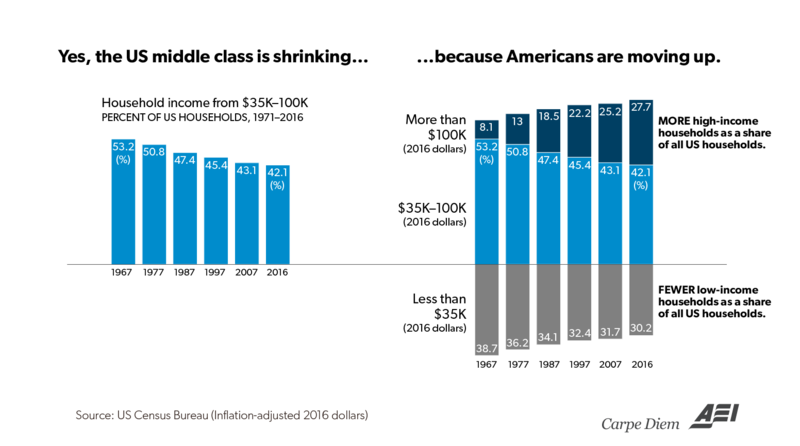 As the right side of the graphic above shows, the shrinking middle-class moved up into the group of American households earning $100,000 or more (in 2016 dollars). In 1969, only 8.1% (slightly less than one out of 12) of US households earned $100,000 or more, but by 2016, 27.7% (more than one out of 4) of US households were in that high-income category. At the same time, the share of low-income US households earning $35,000 or less decreased from 38.7% in 1969 to 30.2% in 2016. Stated differently, the 19.6 percentage point increase in the share of high-income US household between 1969 and 2016 (from 8.1% to 27.7%) was a result of: a) an 11.1 percentage point shrinkage in the share of middle-class households (from 53.2% to 42.1%), and b) an 8.5 percentage point shrinkage in the share of low-income households. Bottom Line: There has been a shrinkage of America’s middle class over time (by either measure above), but it’s not a story of economic gloom and doom, characterized by a “widening gap between what Americans earn and the housing they can afford” but rather a positive story of economic prosperity and upward mobility that has gradually but consistently lifted millions of lower-income and middle-income US households into higher income groups over time. The fact that nearly 28% of US households annually earn $100,000 or more runs counter to the widespread narrative of an American middle-class in decline and deserves much greater attention as evidence of a dynamic and prosperous America with significant income mobility. 2. Housing Affordability. The top graphic above from the Building Museum makes the claim that because “median income has stagnated” while “home prices have surpassed pre-recession levels” there is a “widening gap between what people earn and the housing that is affordable to them.” Unfortunately, the data don’t support that claim, and in fact buying a new house today is more affordable than it was in the 1980s, 1990s, and most of the 2000s, when affordability is measured by the National Association of Realtors’ (NAR) “Housing Affordability Index” (see chart above). According to the NAR, “the Monthly Housing Affordability Index measures whether or not a typical family earns enough income to qualify for a mortgage loan on a typical home based on the most recent monthly price and income data.” For example, the annual income necessary in November 2017 to qualify for 30-year, fixed rate mortgage at 4.2% to finance the purchase of a median-priced home of $248,800, assuming a 20% down payment, would be $46,656. The median annual family income last November of $74,502 would be 159.5% of the qualifying income necessary to purchase a median-price, existing single-family home and would, therefore, be a Housing Affordability Index (HAI) of 159.5 (see chart above). Bottom Line: Since the HAI has been above 100 in every month since April 1986, that means that the typical US family has earned enough income to qualify for a mortgage to purchase the median priced home in every month for more than 40 years. 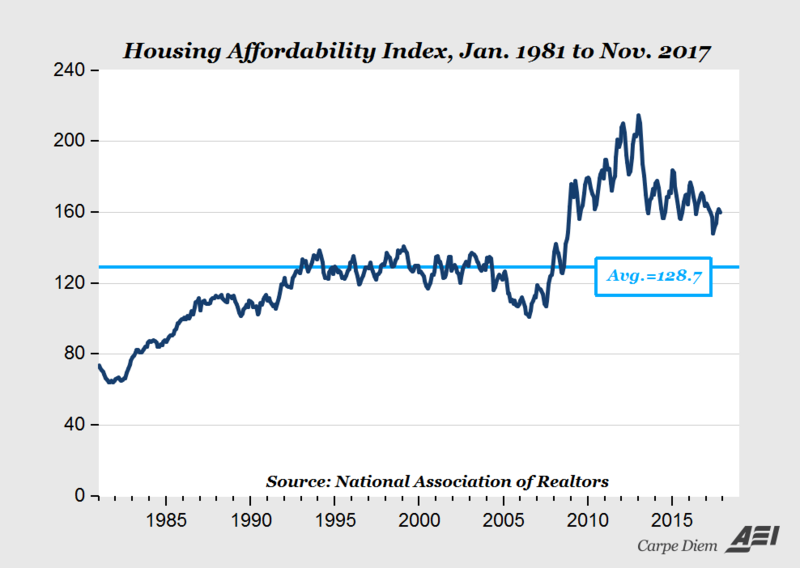 And although housing affordability today at 159.5 is slightly below the peaks of above 200 in 2011 and 2012, it’s above the average HAI of 128.7 over the last 37 years, and is twice the housing affordability of the early 1980s when mortgage rates soared to double-digits for almost a decade and peaked at 18.6% in October 1981. Over the nearly 40 years that the NAR has reported its quantitative measure of monthly affordability, I think it’s fair to say there has not been “a widening gap between what people earn and the housing that is affordable to them.” In fact, it’s been exactly the opposite — housing has become more affordable to the typical American family. MP: I haven’t personally visited the Building Museum to see the “House and Home” exhibit, but will try to visit there in the next few weeks and view the “Shrinking Middle” chart for myself. Thanks to my AEI colleague Olivier Ballou for the tip, the top photo above, and for creating the middle graphic above. For now, I’d conclude that the Building Museum is presenting two false narratives to the public: a) that a shrinking middle class, while statistically true, represents an ongoing economic decline for the typical American, and b) that a shrinking middle class has resulted in housing becoming less affordable for the typical American family. As I hope I’ve shown above, both of those narratives are false. Using the nationwide HAI is using meaningless numbers and claiming the carry meaning. You need to use at a minimium an SMSA median price and wage and show the SMSA HAI. This varies greatly from the coasts to the center of the country. 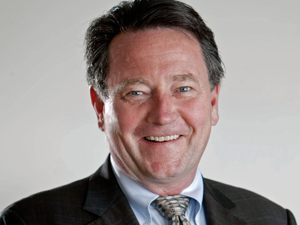 The key point about real estate is that all of it is local and since this is a very old idea. For example the measure is 66 in San Jose Ca and 136 in Indianpolis: Here is a web site that shows affordability by state https://www.usnews.com/news/best-states/rankings/opportunity/affordability Ohio, Mi, Iowa, In and MI are the most affordable and Hawaii, Ca, Ny, MA, and AK are the least affordable. (and of course there are variations within states as well, I suspect prices in Houghton are quite different than Ann Arbor for example. It’s not a meaningless measure, deficient maybe. But it shows over time a quantitative measure of monthly housing affordability using three inputs: a) median price for an existing, single-family home, b) median family income and c) the average rate for a 30-year fixed rate mortgage. Although it certainly varies by region, it’s at least a rough estimate (national average) of housing affordability for a family with typical income (national median) purchasing a typical house at the median price, financed with a mortage at the average fixed rate for 30 years. Tracking that measure over time would allow us to conclude that housing affordability has generally increased over time, and not decreased at the Building Museum would suggest. Mark, would you consider creating a graph of the square footage a median US household income would buy, versus time? I’d speculate that such would normalize the affordability of housing, given house size inflation, no? Or does the “typical home” in the Housing Affordability Index already take that into account? Median house size has been averaging an annual growth rate of 17.41 square feet per year in the U.S. for a long time. Maybe the Building Museum can’t fit the average size house in their confines, nor accurate narratives. The census data works out to a 36% increase in median house size since 1980. The average home built in 1950 was 800 sq ft (plus possibly a basement if the house is in the part of the country where basements are built). The houses in Levittown were about 800 sq foot (32×25). with one bathroom and the like.) So over 70 plus years the average new house has almost tripled in size, plus adding a lot of new amenities. Start with multiple bathrooms, dishwashers, central ac build it stoves, as well as a lot more electrical circuits. Of course as various sites describe a lot of the houses from that time have been seriously upgraded.updated, This web site gives average sizes of new homes by year:http://247wallst.com/special-report/2016/05/25/the-size-of-a-home-the-year-you-were-born/ Note the sizes do bounce around by year in the 1940s from 790 to 1100 or so , in the 1950s rising to 1300 in 1959, http://247wallst.com/special-report/2016/05/25/the-size-of-a-home-the-year-you-were-born/ rising to 1740 by 1969, 1760 by 1979, 2035 by 1989, 2233 by 1999, and 2567 by 2014. If you look at the space per person it has risen from 242 in 1920 to 1046 in 2014. (This is because family size has decreased also making comparing numbers with the past more difficult, you almost have to go with income per capita, (adjusted for inflation) So the number should be median household income per capita not just gross household income. Is this a taxpayer funded exhibit? Who is accountable for displaying these graphs? Is there any way to publicly challenge the claims made in this exhibit? It is a private not for profit organization representing various building industries and other interested parties. 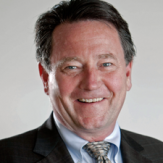 They are free, as we all are, to present any claim they like – which in this case isn’t inaccurate, just incomplete – and which claim was just publicly challenged yesterday by Professor Mark Perry in a blog post at his wildly popular Carpe Diem blog. Within copyright law guidelines, anyone and everyone is free to forward this challenge to others. A link to this blog post from other venues, with proper attribution, would be one way of doing so. Prof, I like the charts and would agree to some extent. But if you have for example 100 people living in NYC or San Francisco and earnin $100k, you would consider them as Middle class or poor. And if you have 10 people in Arkansas making $50k, you should consider them as high earners. In that case, it would affect the percentages. Isn’t it. Thanks. Yes, the chart represents the percentage of all US households earning between $35 – $100K. Obviously members of households in more expensive areas of the country won’t feel as well off as those with the same incomes in less expensive areas. Middle Class is an arbitrary classification in any case, but the point is that the so-called “shrinking middle class”, based on that income range is due to so many households moving out of that income range by earning more than the top limit of the range. Middle class is a perception measured against your peers on a happiness scale. Our family felt middle class with one car, one 800 sq ft house, one black-and-white TV that received a maximum of 10 channels on a good day, one corded telephone, no toys such as boats or RVs, and a stay-at-home mom who cooked great meals with fresh ingredients every day at a sit-down dinner table. We were simply like everyone else and happy. I think people with those things would feel poor today. Obviously, you have no children and no student/parent debt. As a percentage of income, Mark Zuckerberg has more debt than me. I earn $12k a year. He’s a billionaire. Are you absolutely willing to claim I am in a higher class than he? Just a few minutes with Google/Internet will break you of that high. Never have so many people been able to find out so quickly what they don’t have than now. Right, but that’s my point. I do live very well, but I am not in the same class as Zuck. If, as Jorod says, debt should be taken into account, then I am better off than Zuck since I have less debt than him as a percentage of income. I’m saying his measure is irrelevant. Debt does not matter so much — timely cash flow to service that debt is king. Still, $12,000 sounds really low for a Ph.D stipend. The majority of the benefit is from the fact my tuition is paid for. And I do supplement in other ways (I have a modest student loan). But one can live fairly well cheaply if you know where to cut corners and where to not. I mean, I feed two people (my roommate and I) on about $50-60 a week. Nice job on the food budgeting, Jon! My wife and I have spent $188.68/wk the last 52 weeks for food. That counts eating out, and we don’t really try to limit our spending on that budget item. I’ll have to check and see if that is higher than the previous 52 weeks because we have been on a diet the last 41 weeks and have lost about 50 lbs each. Wow! The previous 52 weeks was $136.80/wk. Maybe we should have stayed fat asses! The news might be even better than the article indicates, because, as Thomas Sowell has pointed out, household size has been decreasing for decades. It would be interesting to see the same charts with per capita data plotted.